The World ATA Carnet Council (WATAC), today announced the election of new Chair Cindy Duncan, Senior Vice President of Carnet and Trade Services at the United States Council for International Business (USCIB). 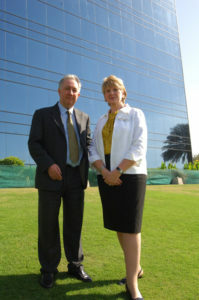 Ms Duncan takes over the leadership role from current Chair Peter Bishop. Receiving the support of World Chambers Federation (WCF) Chair Peter Mihok, Ms Duncan takes over the leadership role from current Chair Peter Bishop, who steps down after nine years at the helm. Managed jointly by the International Chamber of Commerce WCF and the World Customs Organization, the ATA Carnet system enables duty-free and tax-free temporary import of goods of professional equipment, commercial samples, and goods for trade fairs and exhibitions for up to one year. Today the Carnet system is in force in 73 countries. Ms Duncan has served as head of USCIB Carnet and Trade Services since February 2000. She also serves on the Steering Committee of World Trade Week, New York City and on the New York District Export Council. She is a former member of the Board of Directors of the Organization of Women in International Trade, New York and previously served in a number of other capacities at USCIB, including as Vice-President for membership. Ms Duncan’s election took place during a WATAC meeting being held today in Doha on the sidelines of the ICC WCF 8th World Chambers Congress taking place from 22-25 April. “With the sound foundation established by Peter Bishop, support of the new Vice-Chair, and the continuing efforts of the carnet community, I expect that the ATA system will grow even stronger in the years to come,” Ms Duncan said. Ruedi Bolliger, Executive Director Alliance des Chambres de commerce Suisses was also elected Deputy Chair. Mr Bolliger has a strong background and a wide range of experience in ATA carnet matters.